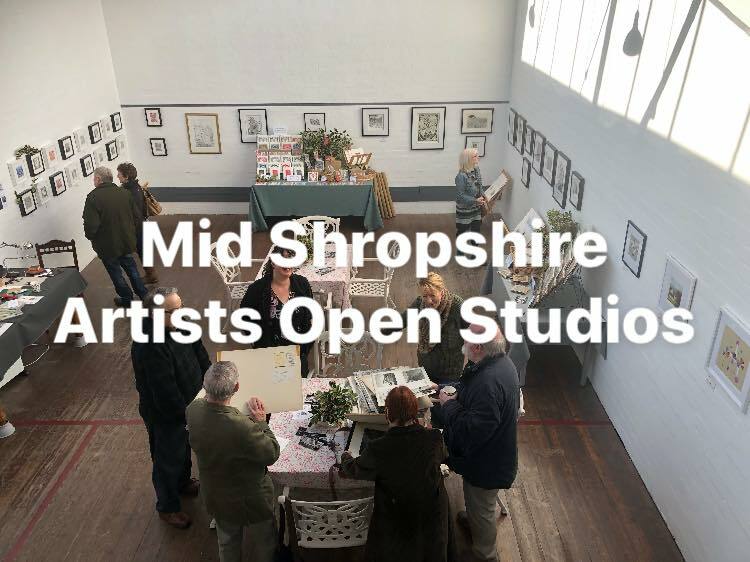 We have had a lovely weekend with the Mid Shropshire Artists Open Studios. It was super to meet and chat with all of our visitors. 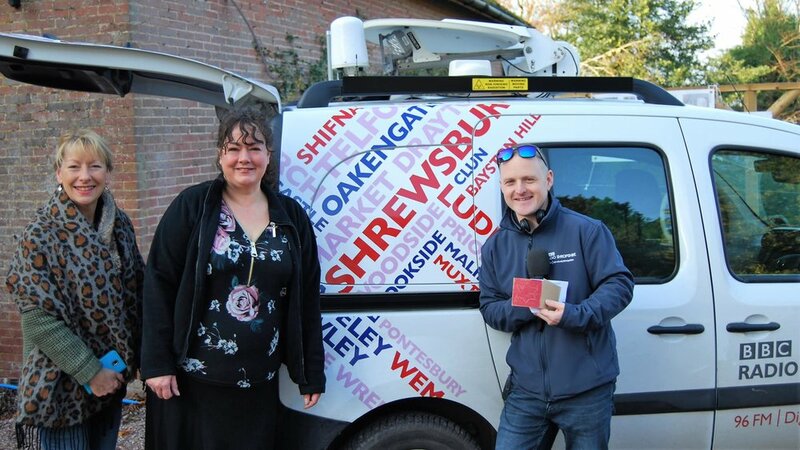 A huge thank you to Andy Broxton from BBC Radio Shropshire for calling in for Ryan Kennedy’s Sunday Morning Treasure Quest programme and stopping to make a linocut Christmas card with us, we had great fun! 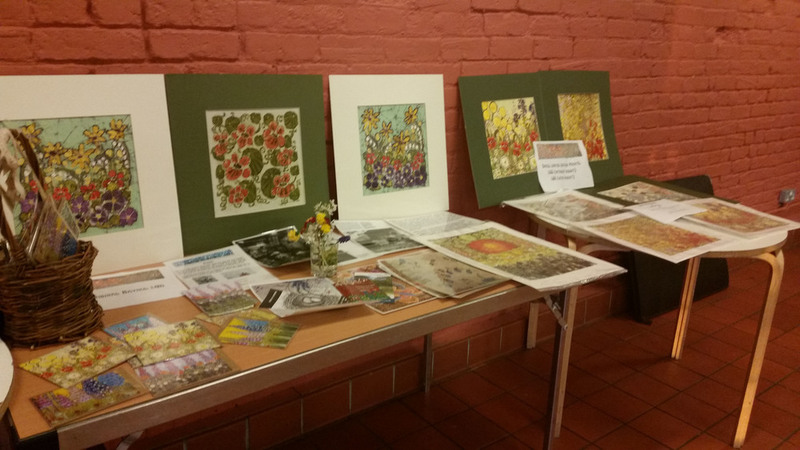 Thank you Linda Nevill for your fascinating and totally engaging presentation ‘Printmaking - my Journey’ on Wednesday last at Bantock House. Your passion and enthusiasm was and will remain an inspiration to us all. For many of us you de-mystified the alchemy of this magical art form and we had a marvellous evening sharing your journey of enlightenment and discovery. The meeting was well attended with many of our members interested in how their art might fit into a commercial and online market. Jaanika’s presentation considered her artistic career to date, her role as a Commercial Art Gallery Owner and introduced hints and tips on how make your art more visible and more saleable. Jaanika studied Art in Tallinn (Estonia), Canterbury and London. After completing her arts education Jaanika’s organising talents were also recognised and from 2008 until 2014 Jaanika was involved with leading exhibition projects both in her home country Estonia and throughout Europe. During this period of time she was involved with over twenty different projects for more than fifty visual artists from thirty-five different countries. Jaanika found herself moving away from creating her own conceptual art although she has more recently come back to it. In 2014 Jaanika launched Okk Arts. Using skills she had gained when organising Art Exhibitions and with her understanding of the Sales Market from an Artist’s perspective she was able to form a bridge between Artists selling their work and Commercial companies wanting original artwork for display in their workspaces. In the second half of the presentation Jaanika gave her thoughts on how the artist can become more sustainable and sell more of their work. Looking at Goals and working out what is the Target Market for your work is an important factor which can make all the difference to increasing sales. Ask yourself the question why do you do what you do? Where do you see yourself and your art in the future? Using target performance tools such as SMART (Specific, Measurable, Achievable, Realistic, Time-bound) together with looking at Business Networking are just two of the strategies at hand to help you set and achieve future goals. Aim high and you will achieve them. Jaanika introduced DACS. For those artists who have not come across DACS, Jaanika recommended that you visit their site www.dacs.org.uk They are a not-for-profit visual artists’ rights management organisation. They can be a good source of information to Artists for example on matters of copyright and they offer help such as Legal and Licencing services. Jaanika is successful at matching artworks with commercial spaces and is very happy to give a consultation to any artist who would like some help and advice accessing this area of marketing and sales. She is offering a free consultation to our members over the next week and if you would like further information she can be contacted at info@okk-arts.com Our thanks go to Jaanika for a very interesting and enlightening presentation. 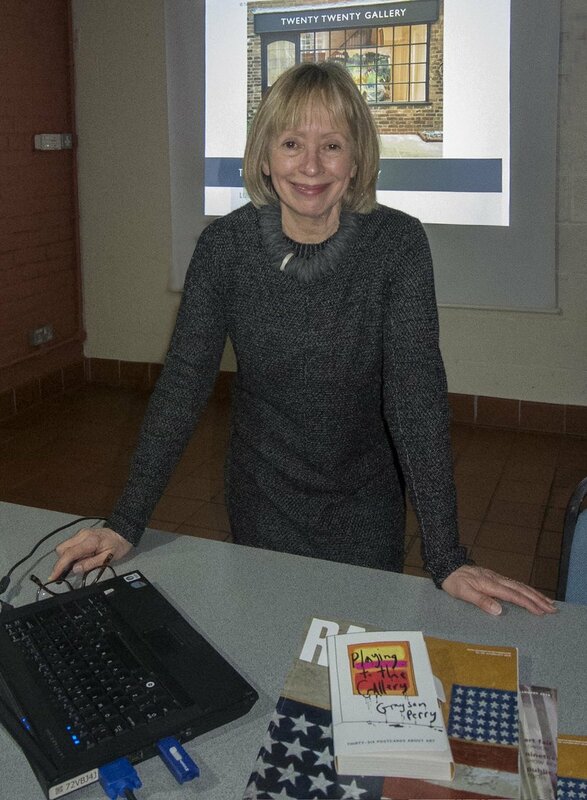 Our guest speaker for the evening was Mary Elliot who is a successful and well respected owner of the Twenty Twenty galleries of contemporary art and craft located in Much Wenlock and Ludlow. Mary gave us a fascinating overview of exhibition opportunities in the UK and in particular the world of art galleries of which she has a wealth of experience. It is a risky, even scary business, approaching a gallery to see if they will show your work. 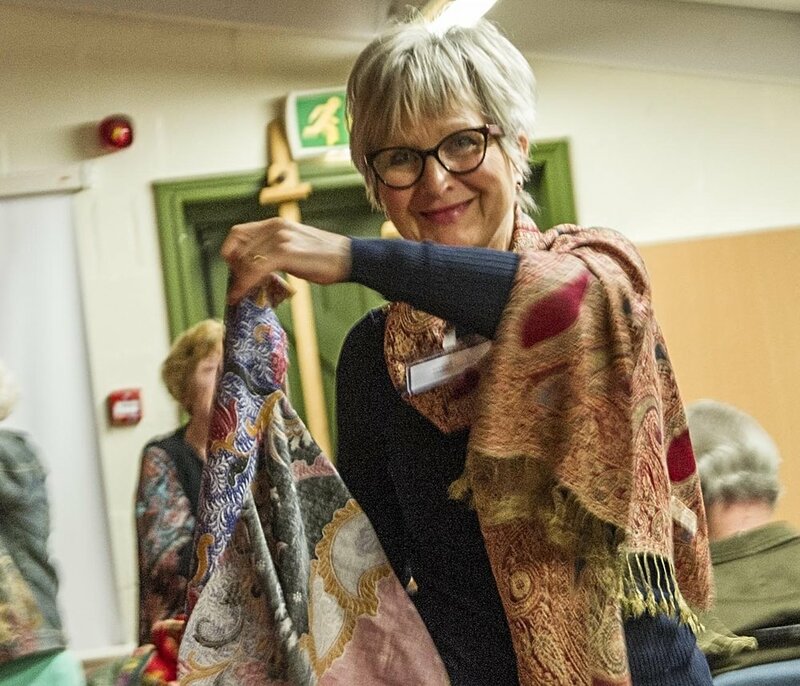 Mary gave us reassuring, methodical and highly detailed advice on how to research galleries, how to approach a gallery and how to prepare for your meeting with a gallery owner or decision maker. It was this level of informed and practical advice that made the talk unique as I do not think it is available elsewhere. When deciding whether a gallery is right for you Mary suggested that you need to be able to assess and evaluate your own work by type, style, position in the market place and value. You need to be sure that you have a coherent body of work, not a mixture of various styles, media and types of work. Sometimes artists are reluctant to discuss money but you need to be confident and sure about the price you have sold your artwork for in the past. Galleries are usually interested in artists who make their living by selling art or are on the cusp of becoming professional as they want that level of commitment. The above just gives you a glimpse into the very insightful information shared in both the talk and the question and answer session. 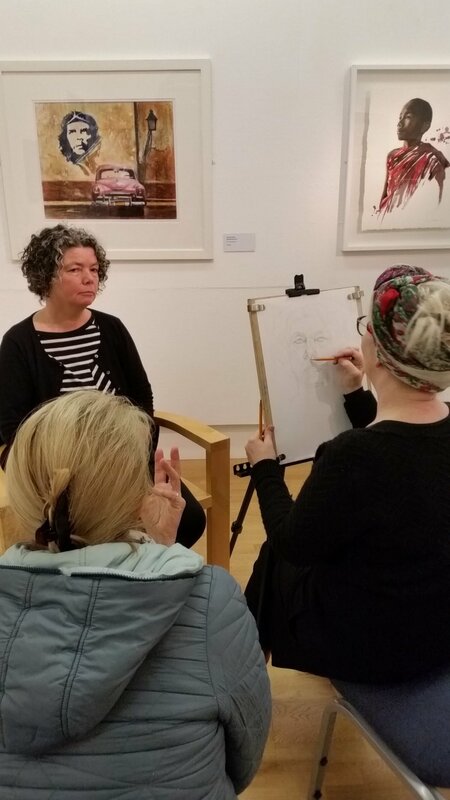 Mary looked at some of the pros and cons of social media and also gave advice on other ways to show your art, for example at open competitions at the Mall Galleries in London. She also reminded people that Arts Council England and Art Quest list exhibiting opportunities. It was a very enjoyable evening that got people thinking about exhibiting from a gallery owner’s point of view. Guest Speaker Evening 21st February 2018. This particular evening was delivered using a slightly different format to our usual Speaker Night. Following on from our January event where we brought in our own work to be critiqued by our guest for this Guest Speaker evening it was the audience who were to provide the critiques. Our Guest Peter Randell very kindly brought along thirteen paintings (all very different) which form part a considerable personal collection which has been gathered together over several decades by himself and his wife Denise. 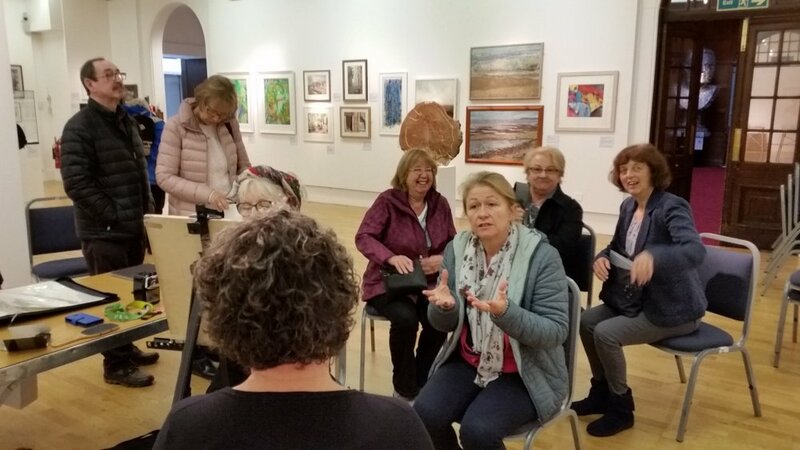 The paintings were displayed on easels and then members of the audience were asked to consider the artworks and share their thoughts with the group. It was a brilliant opportunity to see some really fabulous pieces of artwork ‘in the flesh’ and take time to look at the brushstroke detail, composition and appreciate the emotions they stirred within each of us. 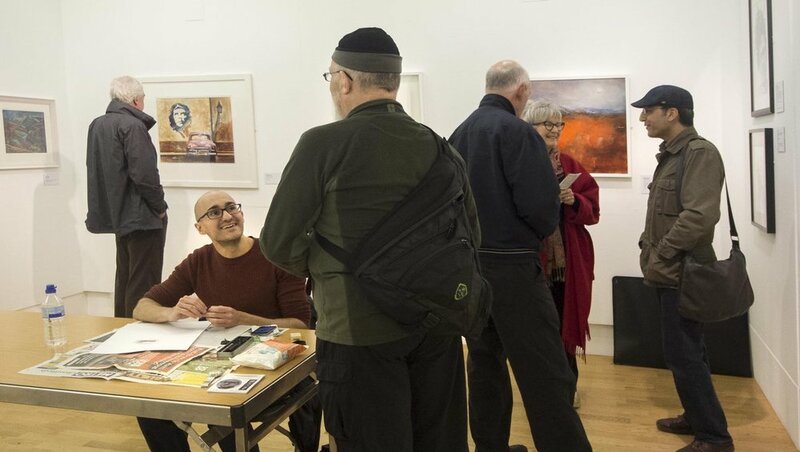 It was fascinating to discover how being together and talking about the art provoked such a wide and varied response. Furthermore, we discovered how this approach can enlighten your own view regarding a particular aspect of a piece of art. Peter and Denise have a very good eye for buying art works which have not necessarily been painted by ‘famous’ or ‘popular’ artists. They purchased pieces of artwork because they were attracted to them, finding aspects of the intrinsic emotion within the painting that appealed to them both. Peter really enjoyed chatting about the work that he and his wife have collected. On the night he found it gratifying to learn that they had made 'good choices' over the years and he commented that some of the feedback from such a talented group of artists was enlightening for him too. As a sincere thank you to Peter and as a token of his strong contribution to what had been an excellent evening the Society was delighted to present him with a gift of drawing by Glynn Bonnington, which Peter had admired at our recent exhibition at Wolverhampton Art Gallery. Member feedback indicates that this was a thoroughly enjoyable evening with the thought we provide another similar event in the future. Our guest for the evening was Brendan Flynn – a familiar face to the Society by now as he has advised and supported us on many occasions. Highlights of Brendan’s comprehensive CV include - Keeper of Fine Art and later Senior Curator of Visual Art at Wolverhampton Art Gallery. In 1998, he was appointed Curator of Fine Art at Birmingham Museum and Art Gallery where he developed the Pre-Raphaelite, Modern British and Contemporary International Art Collections. He retired in 2012 and is now working as a freelance exhibition curator and lecturer. In 2015 he was elected Professor of Art History for the RBSA. Having your work appraised in public can be both a challenging and enlightening experience and in spite of the miserable weather, the evening was very well attended and supported, particularly by the newly admitted members. Brendan’s honest and constructive approach was very much appreciated and well received by all who attended. 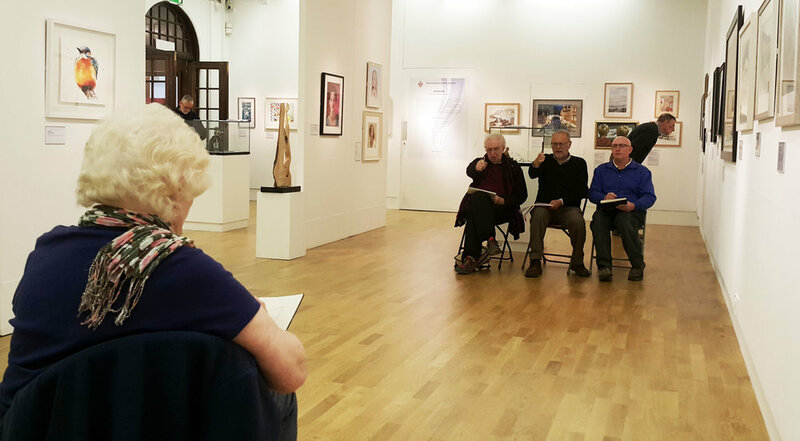 A wonderful day at Wolverhampton Art Gallery doing ‘Portraits in Pencil’ demonstrations at the WSA exhibition. Thank you to the models and the visitors to this super exhibition who watched the demonstrations, exchanged ideas and shared my enthusiasm for portraiture. I have two places in my Life class starting Tuesday 28th November for those who are interested. A journey through time and place, with multiple stimuli along the way. The audience was taken from essential garments devised by our ancient ancestors to garments becoming a de facto representation of the wearer’s rank and power. Witness portraits of Elizabeth 1 as she rose in the ranks, and the fact that several dynasties have enforced control over certain colours. Key traditional south-east Asian batik techniques were explained using numerous pertinent exhibits, with a focus on the tutor Teng Thean Chuah, and his once pupil Joo Kim Seah. Joo stepped outside the confines of established practices and is now the best batik artist in the world. Artists’ use of textiles in their paintings was explored. Props to provide an overall ambiance; garments to draw out the character of the sitter; or as a key element of a composition – reference the headscarves used in Vermeer’s ‘Girl with a Pearl Earring’. From Cave paintings to present day, textiles have played a major role in artists’ recording of the world around them. This is nowhere more obvious than tapestries – once more desired (and more expensive) than paintings, their recording of history was proudly hung from the patron’s walls – and today Grayson Perry’s modern tapestry take on Hogarth’s ‘Rake’s Progress’ draws the public into its embrace. At the beginning of her presentation Margaret stressed that she was not telling the audience what to do. Her key premise emphasised there is no distinction between art and craft, and that artists should absorb from numerous sources to advance their own practice. In her words “have the curiosity of a cat, and the acquisitions of a magpie”. Margaret’s advice was not to recognise conventional boundaries, and to take influences from everywhere. The second exhibition was well attended, Vic Hayward although particularly well known for his pastel portraits has a beautiful street scene in this exhibition and demonstrated his technique with pastel. Robert Cox, known for his depiction of nature through his beautiful sculptures in wood, explained his working methods with questions and answers session. On a grey looking Saturday morning WSA members gathered at Bantock Park for our day out. We boarded the coach and then discovered that we were not able to park in the Bantock Park car park as we had anticipated as a wedding venue being booked. However with not too much inconvenience everyone moved their car and rejoined the coach. Our driver Hakim then proceeded to perform a magnificent three point turn of the 56 seat coach in the Finchfield Road which was neatly executed followed by a round of applause from everyone on board. Then we were off and away. Rain clouds were threatening but it was warm and there was promise of sunshine later. With no other hiccups on the motorway we safely arrived on time at 10.30 am at our destination. We were warmly greeted by the Compton Verney staff and there was time for coffee and refreshments before the guided tour around the special exhibition. We began with our own wander around the British Folk Art exhibition with paintings, textiles and objects from 18th, 19th and 20th centuries. After the tour we were able to split up and either eat, visit one of the several permanent exhibitions or wonder around the gardens which were designed by Capability Brown; or even visit Capability Brown’s chapel which had on display some fine stone work and Verney family tombs. After a delicious lunch in the Café my husband Tim decided to investigate the Chinese Exhibition which is the third best in the world outside China. On the other hand I returned back to have a closer look at the special landscape exhibition. Constable, Piper, Millet etc were all there. An absolute delight and the space around us meant we did not feel overcrowded or rushed. The only problem was that we ran out of time and could not take full advantage of all that was on offer. So we have promised ourselves that we will definitely return in the near future, maybe with a couple of art friend aficionados, to enjoy the gallery and grounds once more. Oh and by the way the sun did come out after lunch. We travelled home with the sun shining and much chatter about what we had seen and enjoyed. In closing thanks go to Rita for organising the Coach and the talk. Vic also did a sterling job with the finances. Feed back to date has been very positive. Compton Verney is home to six diverse collections of nationally and internationally significant art from around the world, including British Folk Art, Chinese bronzes, British Portraits and works from Northern Europe and Naples. You can also find objects of inspiration and original textile designs by Enid Marx in our Marx-Lambert Collection. The gallery is set within 120 acres of Grade II listed park, landscaped by 'Capability' Brown, the most eminent landscape architect of the eighteenth-century. Today the grounds still reflect his 'pleasure grounds' of sweeping grassland, ornamental lake and Cedars of Lebanon for which Brown is famous. The evening was extremely well attended by members and it was great to see new members join us too. 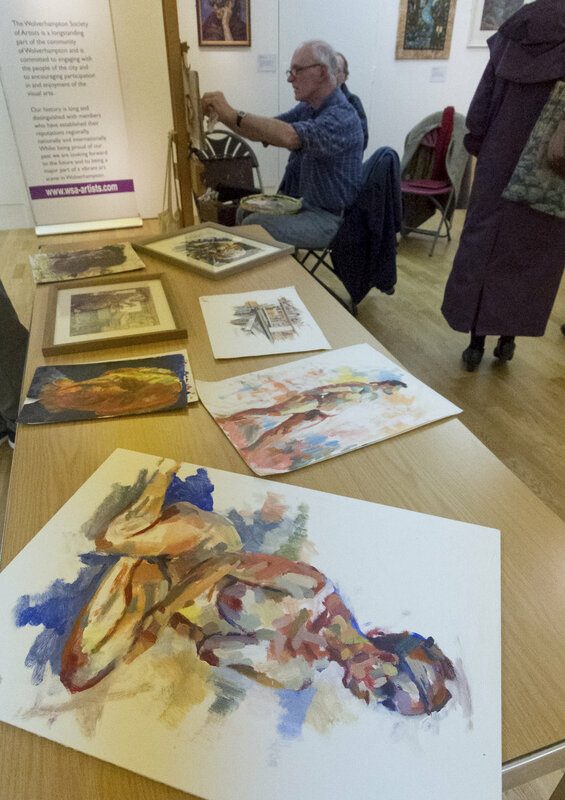 They had come along to see a watercolour demonstration by Bridgnorth based Artist and Gallery owner Paul Hopkins. Paul has been interested in painting from an early age. He studied at Bournville School of Art completing an HND in technical illustration. He became a professional artist in 1996 and has sold his work in galleries and exhibitions all around Britain. Paul works in all mediums but produces many of his landscape works in watercolour. In order to complete a landscape in the one and a half hours allowed at our guest speaker meeting Paul had already completed his preliminary pencil drawings. His landscape reference was a photograph he took of Llanberis Pass in North Wales. The picture was taken on a sunny day in November. Paul worked from the top of the picture down to the bottom during the demonstration and in general worked from light to dark. The sky was completed first by using the wet-in-wet method. This he needed to dry off using a hairdryer before moving onto the mountainsin the distance. The picture had three distinct areas ; the distant view, the middle and the foreground. Using a very limited palette of Cerulean blue, Ultramarine blue, Cadmium red Rose madder and Yellow ochre with a tiny bit of Lemon yellow at the end Paul quickly built up the colour layers. He introduced warmer tones as he moved further down the landscape creating depth and perspective. Paul reminded us how important it is to observe the position of the sun in the landscape and reflect this in the shadows that are created. With only minutes to go Paul completed the work on his demonstration piece. You can see the results from the photographs posted on our site. Paul is a technician when it comes to watercolour painting. His knowledge of colour and how it works within a landscape was clearly evident and this enabled him to confidently produce a professional work in a such short space of time, much to the enjoyment of the members. Wolverhampton Branch of the Embroiderers' Guild. 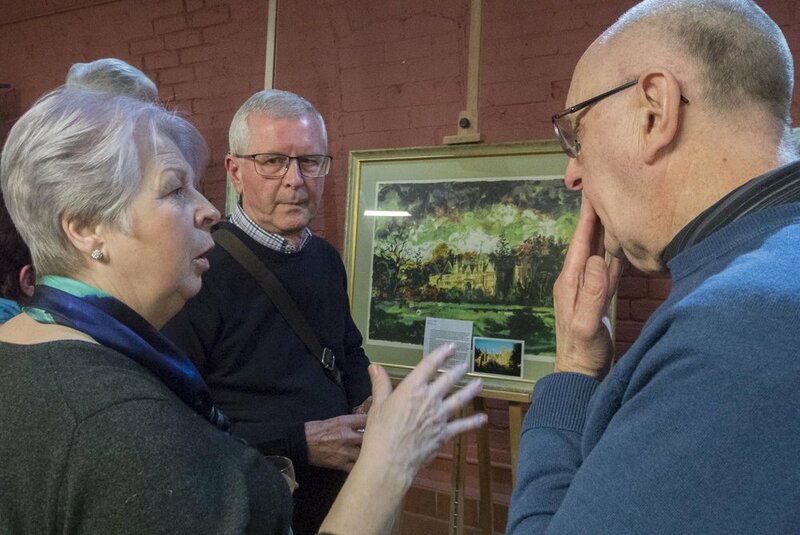 The members have created pieces of work to exhibit in the beautiful surroundings of Wightwick Manor, a National Trust property that provides endless inspiration. What you will see as you travel through the house is a varied collection of pieces created using a wide range of textile techniques,The pieces have blended into the house beautifully. Thanks to Louise Bloomer for organising this with Wightwick Manor. I have taken photos of all the pieces in situ. As I walked around the house taking photos people were very complimentary and some were amazed when they discovered that the pieces were not original to the house. High praise indeed. Ten members of the Society had enrolled themselves onto the Clay sculpture workshop.The day began with Petra giving us an introduction to sculpture; the human form and in particular the head. We spent a little time considering inspiring works created by such artists as Henry Moore. We were provided with all materials required for the day and all we had to bring along was an apron to wear and photographic reference for our clay model. Our aim was to create a scale model bust from our photographic reference. The workshop was presented by Petra in a reassuring and informal manner and instructions were easy to understand. Petra was at hand to help with any queries and concerns throughout the day. The whole process was presented in simple steps and we had a fabulous time creating our 3D images. Working around a very basic shape we slowly built up layers of clay being careful to remove all air bubbles, creating smaller scale versions of our chosen photo reference. Working with the clay was all absorbing and the time flew by. The afternoon was taken up with hollowing out our sculpture pieces ready for firing which was to be done at a later date. Petra was an excellent tutor who presented the course in a friendly and relaxing way and we are looking forward to collecting the finished sculptures after firing in a few weeks time. Here is a review of the presentation given to us by Wayne Horton last week. Review by Neil Davies with photos by Fred Lowe. On 15/03/17 the WSA had a presentation on “Framing Techniques” by Wayne Horton from The Framers Gallery. It was soon apparent that it would be a good one. Why? - because Wayne has a truly in depth knowledge of his craft and all that goes with it. A brief historical precis of ‘integral’, ‘semi-integral’, and ‘engaged’ frames brought us to the late 15th / 16th century, when the frame and the painting became two separate items as we would recognise them today. The main body of the presentation provided a guide to the tools, materials and methods used in assembling a frame. Too many to list here - but videos, examples brought in, and good sequencing made absorption of the facts easy for the audience. This grounding allowed the audience to appreciate the rules and complexities of ‘conservation’ and ‘museum’ framing. This really brought home what good framing does – it protects something special – and in the case of ‘museum’ framing, protects it for 35 years. An overview of the framing possibilities available today rounded things off nicely, with numerous examples of the most up to date and ‘trending’ styles being discussed. This was where Wayne really showed mastery of his trade, not through facts and figures, but through years of experience. 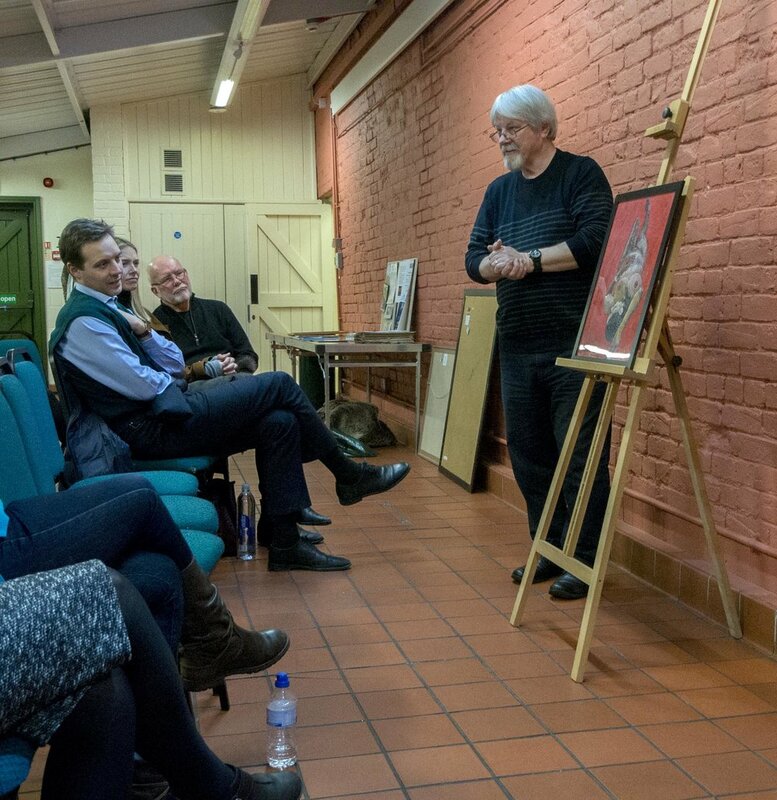 A dark wintry evening saw Wayne Attwood (RBSA) join us in the Tractor Shed at Bantock Park to talk about his Birmingham New Street Artist residency. Those of us who had braved the cold were in for a treat. Wayne started with a brief introduction about his early artistic career which incorporated both very fine art work and illustration & design. In an interesting resume of his life so far Wayne talked about spending time living on his 35ft yacht ‘Hitrapia’ in warmer Mediterranean climes ,visiting interesting harbours and cities and painting ‘plein air’. However despite enjoying this sun kissed idyll Wayne eventually came to realise that his passion lay in cityscapes and returned to Britain to paint in his home city of Birmingham. When taking up his residency at a fast developing New Street Station Wayne first of all had to come to terms with working in a somewhat challenging environment. Health and Safety was paramount and he had to get used to wearing heavy protection and being constantly aware of the dangers of effectively standing with your artist materials in the middle of a building site. Wayne aims to capture a ‘sense of place’ which he does very effectively with perceptual mark making. This is very evident in his work showing the reconstruction of New Street Station. He works by making small studies in situ and uses his visual memory to record the scene once back in his studio. Recording the people was as important to him as the machinery and all that scaffolding. Wayne builds his work up in layers with the whole of the painting being worked on at the same time and constantly being modified. If a particular area is not working Wayne is not afraid to destroy that area and start all over again. He uses rollers, paint dribbles and even credit cards to create texture and edges. The results are superb. He creates a fabulous record of the moments he has captured using his perceptual mark making technique. The paintings are vibrant and alive – you really can imagine you are there. Wayne’s talk was extremely well received by all the members that were able to attend. At the close Keith Oram Society President on behalf of the Society gave a short closing speech to thank Wayne for a very interesting talk. 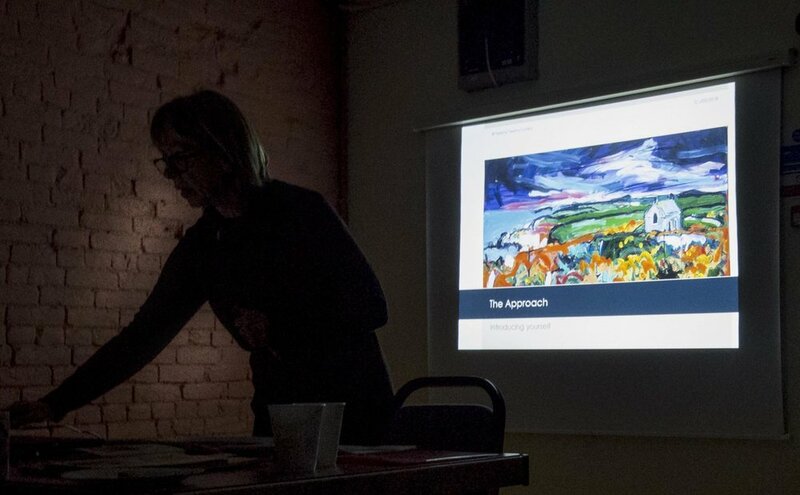 Here is an overview from Keith Oram of the interesting critique evening that we enjoyed in December. Thank you Keith for a very interesting evening and for this excellent summary to remind us of the very valid points raised. I thought it might be valuable to give a quick round up of the Christmas critique evening before the much enjoyed social activities began. The work was generally good, but that is only to be expected from a Society of artists. There were a number of interesting points that arose from the works we looked at and I hope this very brief resume will be useful. Photographs are a 2D representation of a 3D world; they give the viewer a flattened view of the world. Copying a badly composed photograph can only produce a badly composed and unsuccessful painting. If the only purpose is to copy a photograph then it ought to be a photorealist painting. However most people in the society that use photographs use them as a reference point as such they should be used in a very selective way; a jumping off point rather than a point of arrival. If time is short a quick sketch with supporting photographs may be a way forward. Take only what you need from the photograph. This was probably the major consideration throughout the whole session. The works we looked at, particularly the landscapes, proved beyond doubt that the so often quoted one third to two thirds ratio is a nonsense. Composition should serve the art work, guiding the eye of the viewer and illuminating the artist’s intentions. The purpose of the compositional element of an art work is to create a focus/focal point from which the viewer can be taken around the work. The works we saw illustrated clearly the use of light in the darkness, darkness in the light and the very subtle presence of lighter elements within light. Painting portraits The works we saw highlighted two things to be aware of when painting a portrait. Firstly that flesh tones can be made cooler in the shadowed areas of the face and warmer in the well lit areas to create a more natural look. The fact that cool tones recede from the eye and warm tones advance towards the eye help to accentuate volume and form within the facial features. The second thing was that flesh tones are often much lighter and darker in contrast to each other than we think and that these tonal contrasts are necessary to create volume and form. The one drawing we saw from the model illustrated perfectly the need to establish not only proportion and foreshortening, but also where the weight lies in relationship to the way the body is supported. We also discussed the way the centre of gravity is important to creating where that weight lies. There is a misconception that abstract art that it is easier than naturalism and figurative art works, in reality it is much more difficult to create a successful abstract art work. Composition, structure and the underpinning raison d’être of the work play a vital role in the success or failure of a work. Titles are important because they give clues to understand the work. There are times when titles are sometimes deliberately enigmatic, but they should still elucidate rather than mystify if they are to engage and lead the viewer to a greater understanding of the work. it says on the tin?” Does it achieve what the artist set out to do? This can be discovered by analysing the composition, line, tone, colour, form and all the other clues that help us read a work of art. It is well to remember that line, form, arabesque, volume, mass, compositional elements and positive and negative space are vital components of 3D work. The very last thing to be asked is, “Do I like it?” I can think of many very distinguished and good works of art that I dislike, but still recognise their greatness. On the evening of 16/11/16 the guest speaker provided the society with insights into her journey through the art world. The initial (and lasting) key driver for Dr Dew Harrison was Marcel Duchamp and his aim to put intellect back into artists’ practice, together with utilisation, adaption, and expression of the most recent technologies. Dew reflected on individual and collective works, emphasising her own focus on digital media, but never losing sight of a key general principle – namely, the generation and investigation of ideas up to the fusion point at which a concept is born, and then nurtured by the artist(s). The audience was provided with glimpses of a collectively created online island, 3D printed avatars, interactive installations, groups of Duchampian Objects flocking across the screen – to name but a few. Did this speaker leave the audience with questions, with answers, wanting more? Yes. Click on the picture to see more pictures from the demonstration. A fabulous day! Wayne showed us some of his work, explained key technical information, demonstrated his way of working and gave detailed one-to-one feedback on our paintings in progress. The most informative oil course that I’ve been on I thoroughly enjoyed it. Wayne’s a great teacher. A very practical and well thought out session. There were many requests for a longer, return visit by Wayne to develop our work further. We are looking forward to his talk on his talk about the New Street residency and may well bring our finished paintings to show him then! Pictures of Julia Timmins and Pauline Faulkner Julia Timmins and Pauline Faulkner demonstrating and talking about their method of working and in the Gallery . Pauline had a selection of experimental work - oils, encaustic and sketches that may be used to produce a final piece and discussed her working methods. She talked about her techniques and demonstrated painting in acrylics. Most of Pauline’s work is influenced by natural forms. 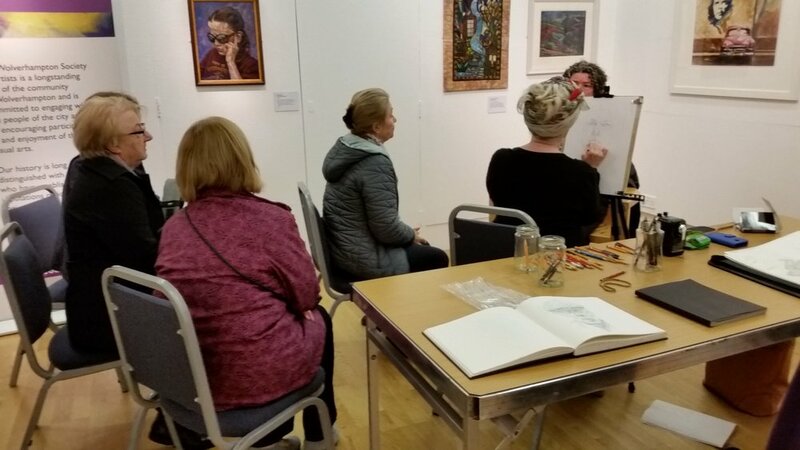 Bob Ormerod and Vic Hayward demonstrated their method of working in the Wolverhampton Art Gallery for our second Saturday of artist demonstrations. Bob is well known to most members as he organises our summer painting days which are always popular and Bob rarely misses attending himself. 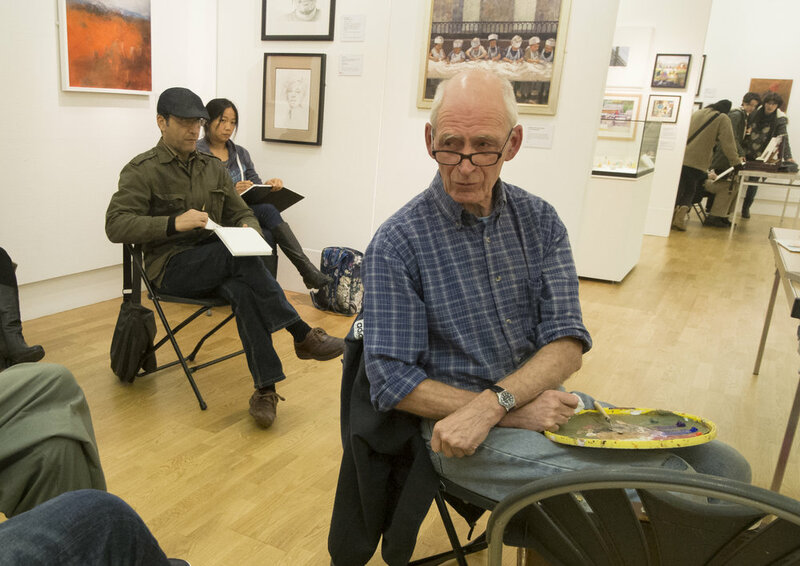 Bob shared his tips and ideas with us, he is particularly fond of painting scenes and people. Vic demonstrated his technique with pastel. Vic was awarded the Curators Choice Prize – Highly Commended for his pastel work in this exhibition “Taking a Break”. Vic is particularly well known for his pastel portraits. Everyone is very welcome to come along to this event. Ed Isaacs demonstration of his urban sketching technique went down really well, Ed was sketching people and scenes within the gallery and passing on tips and ideas. This was a great opportunity to see some of Ed's wonderful sketches and sketch pads. Layla Tutt who is a local batik artist and, as she told us herself, first and foremost a rock chick and musician. Layla introduced us to batik by showing a number of her own works as well as creating a piece on the night, we were also introduced us to the tools of the trade. The key tool is the tjanting which is used to create outlines in hot wax. This wax serves as a resist, creating an area protected from the paint which is then applied, finally once the paint has dried the wax is lifted out with a hot iron to leave the finished creation. Members have the opportunity to visit local places of interest and enjoy (weather permitting) a day in the fresh air, drawing and painting. Painting days run from 10 am to 4 pm approximately. Members should provide their own refreshments. Toilets are available at every venue. Some venues charge admission or ask for a donation to charity. You are welcome to bring along friends and family members but everyone attending does so at their own risk.The painting days programme runs through June, July and August each year. 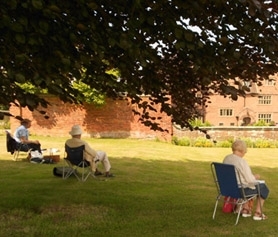 Pictured below, Stanley Hall, a painting day venue. These are usually a one day practical session with a tutor to demonstrate and give guidance in a particular media or subject matter. The workshop programme covers a wide variety of approaches. 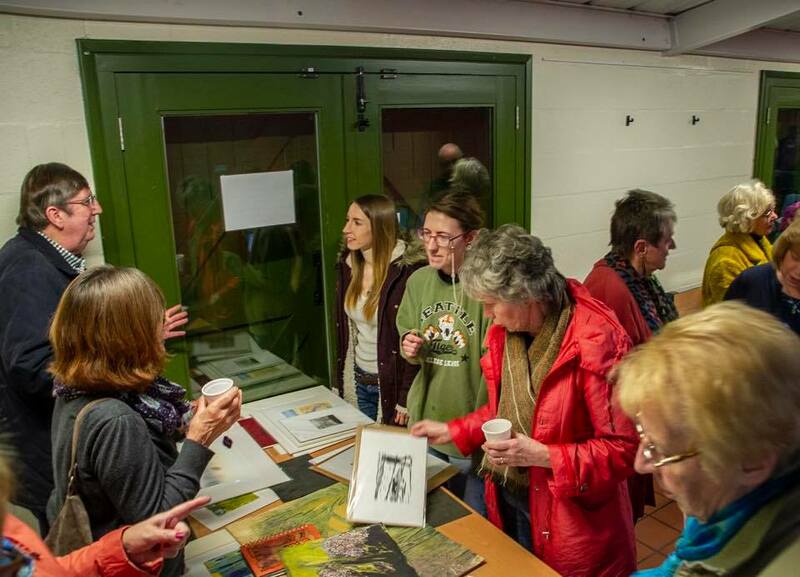 The photo below shows a demonstration as part of last year"s very sucessful intaglio workshop with Paul Hipkiss.